Do you ever get one of those thoughts that just won’t go away? Like a kid with a loud new toy, the thought pops up, over and over again. Totally exhausting, and completely irritating. Here’s one I’ve been having: I should chop all my hair off. Right now. It’s become an obsession, over the last week. Lob or bob? Layered or blunt? Dark or light? My Pinterest peeps must be sick of me, and the dizzying variety of new hairstyle pins I’ve added to my board. That’s why Crystal’s recent post about making fewer decisions, came at the perfect time. It reminded me why change — disguised as decisions, variety, and choice — is not always a good thing. The last time a big urge like this came over me, I chopped off over a foot and a half of length, well into pixie crop territory. About that time, I was diagnosed with severe depression, which taught me something important about how my need for change relates to my mental health status. When the craving for change surfaces, it’s usually because there’s something else going on. Something I can’t control. Work, home, or life has thrown too much at me, and giving myself a choice is like giving myself control. Okay, okay. I hear you! As stress levels rise, our need to control something (anything!) increases, too. Control manifests itself as choice. So, the more choice we have, the happier we should be, right? The real reason might surprise you. Ashley Trexler loves honest talk about parenting and life choices. She blogs about the good, the bad, and the funny at Lies About Parenting. She is known for debunking popular parenting advice that just doesn’t work, and is a passionate believer that clean homes create clean minds. She’ll consider herself a parenting success if she can, somehow, manage to raise kind and compassionate kids. « Get a Floral Infinity Scarf + a Geometric Print Infinity Scarf for just $9.94 shipped! Interesting perspective. My experience is that when I get obsessed with making a change it’s normally because I’ve become stagnant and I need to stretch and grow. I like being comfortable and sometimes those nagging little thoughts over and over are my prompting that I need to get out of my comfort zone. Either way, you’re right that we should pause and ask WHY we’re having those thoughts! I agree with you. When I get depressed, I refuse to do anything! I refuse to cook, do laundry, organize etc. I just want to sleep. So the moments when I think I need a change, it’s usually about stretching myself and growing. But this post helped me understand that there are many people who struggle differently than me and I do not have to get confused if something is wrong with me just because my response to stress is different! I loved this post because now I can understand people better when they have struggles similar to what is described here in this post. You have a very interesting POV here. I like the way you control your life, your emotions and all the things that you do. Everyone is dreaming for a complete freedom. At least in this post, you are proving you have it. Awesome idea. Travel is tough, isn’t it?! What you describe is spot-on, Danielle. I do the same thing. It’s made me really work to bring less stuff with me, when I travel. I’m not always successful, but capsule wardrobes go a long way to eliminating some of the stress of travel. Then, I just have to fold (and re-fold) the same few items to decompress! I’ll also take a quick break for 15-20 minutes. Read a book in a corner, go get a coffee, run to the convenience store…just anything to relax a little. Makes a big difference, doing something just for yourself! I was shocked to read this….you could be telling my story! I came to this same realization a couple of years ago. It takes me a while to realize that my depression has come back, but like you, if I start HATING my hair and wanting to do something drastic, I’ve learned its time to check my mental health. (Sometimes it creeps up on you). Good luck to you. For me, it’s closets and drawers and toys and books. They ALL must be organized. ALL over the house. ALL at once. I often go on a spree like this when I am stressed or another area is outside my control. It beats trying to hyper manage people, but it can be exhausting. I’m the exact opposite. I fear change. A lot. When my stress levels get high, I retreat to something, anything, in my comfort zone. The familiar calms me down. I recently had a major shakeup at my job (new positions were created. A lot of people got switched around, myself included). Suddenly, I had all these new reports to do, I was working with higher level execs. I spent my first conference call sweating bullets hoping my reporting skills were up to par. My one saving grace? I didn’t have to move my desk. I’m still at the same workstation, surrounded by the same people, with my familiar desktop settings. It keeps me calm knowing I don’t have everything changing on me at once. Ashley P, you’re definitely not alone! People handle stress, and change, in such different ways. It’s great to hear you’re working through your stressful changes, and most importantly, you’re aware of what triggers your stress. Way to go, girl! Stress, depression and anxiety frequently lead to change. I find myself delving into research when I am faced with a change, decision, frequently spending hours learning about something only to find that the ‘something’ is not even a viable option. I research when I am anxious too. I feel like whatever I am anxious about must have a solution and if I keep looking hard enough and take enough notes, I will find it make a very detailed plan and everything will be ok. However, when I get right down to it, what I am researching obsessively isn’t even usually what is causing the stress at the moment, that is usually a potential future stressor that I add to my existing pile in hopes of controlling something. Um. Wow. Loved the article. Very insightful. I guess I’ll cancel my hair appointment for Saturday. Just kidding. Kind of. I try to use change as a tool to take control and refocus. Even if its something simple like rearranging the furniture, or in the example the author uses, redesigning my image. I think it gives me confidence to tackle other issues, and a new perspective. This article brings up some important things to consider! I think we as parents often dismiss our well-being in favor of our children’s well-being until our needs are so glaringly obvious that we can’t avoid them. Now, sometimes these needs come disguised as a sudden desire to cut our hair or buy that fancy car, etc. we should all strive to put our needs at least parallel to our children’s needs. It is hard though! Ashely, great post! It sounds like we have a lot in common. As my kids have gotten older I recognize that needing “me” time will often trigger the need for change. And I’ve come to note specific times when gaining “control” — in a healthy way — can get me back to where I need to be psychologically. Transitions for example: When the kids were home for Christmas break, I needed to do some serious cleaning out/organizing right before they went back to school in order to be in the right mindset for work (at home) Monday morning. Wonderful perspective. When I become obsessed about (doing or having) something, I find that it is often due to stress, like you said. In my case,I find that it’s around something I’d like to avoid. Coping strategies are unique to say the least. You’ve sparked a great discussion Ashley. Thank you for giving me something to think about! Not everyone will share your experience, but we can certainly learn from your wisdom. Next time I start obsessing, I’ll stop and try and figure out why. Oh my God! I have been looking at pictures of pixie and bob hairstyles to figure out which ones I like. I have been having this insane idea in my head to chop off my frizzy hair for the last few days. My daughter and I have been in house arrest for the last four weeks. She has a compromised immune system and a little cold that refuses to go away has a huge potential to turn into pneumonia. So no school and no friends over until she is better. This makes me hesitate and rethink why I actually want to do it. Yera, you’re in a tough situation right now, aren’t you! Maybe waiting a couple more weeks is a good idea…I’ll often transition (as some other commenters suggested) to gathering items for donation, or cleaning my closet. A result you can see is, maybe, what we’re really looking for? Good luck. I agree and feel the same although I don’t cut my hair. In fact I’m known for not cutting my hair and needing too…I sort of hide behind it so when I do cut my hair it’s because I’m finally feeling confident and free. I’m a cross between a hoarder because I work so hard for every penny… and an obsessive compulsive de-clutterer. I have a small house with lots of junk. I will often go on rampages of throwing out, donating and recylcing things and drive my baby daddy insane in my wake. My home is a very neat and tidy, organized mess that I cannot stop cleaning. I have eclectic taste so that doesn’t help…Everything is unique and matches yet doesn’t at all…. I absolutely agree that I love to torture myself with this when I should be focusing on life itself and being present in the moment with my children. It is all done because I feel a loss of control in my relationship or my job. I’m glad to know that we all have these tendencies, even the ones that seemingly “have it all together”. Now we understand the TRUE meaning behind the “mom-bob”. Kiersten, you hit the nail on the head with your comment, “Now we understand the TRUE meaning of the word ‘mom-bob’.” Maybe not for everyone, but for many of us! Interesting point of view. When I cut all of my hair off, it was because I did need some change in my life and cutting my hair was a way of symbolically starting fresh. Ha! I just chopped my hair because I wanted a change! And I fantasize about uprooting and taking my family on some crazy adventure. Live in Austrailia for a year and do as the locals do, backpack the PCT, and the list goes on. It hasn’t helped that I usually get a three year itch in a location. We’ve been here since 2012. I had some minor complications after delivery. In the first few weeks I wanted to change everything. I went for hair cut and was cleaning the whole house (doctor asked me not to bend or do heavy work) within 2 week. I wanted to change everything. Now I understand what it is. This is an eye-opening post. thanks for sharing it. Good post Ashley, I think when you are stressed out than something is not working in life. Life should be fun but when we don’t find the time for fun it ends in a disaster. It’s a good thing when you recognize a pattern and that you know what to do when it’s happen. Both your post and the one I linked to are helping me connect a few dots about why I have certain responses that keep happening, whether I want them to or not sometimes 🙂 Thanks so much! Glad this was helpful, Diana! I checked out the other post, and there were some great insights there, too. Thanks for sharing. For myself, I usually feel stressed when I’m resisting change! Wow, I have never made the connection, but I have done this very thing! Not always hair, but buying a outfit very different from my usual style or even changing something big in the house. Excellent post! Next time I get the idea to do something radically different in my life, I need to look at my stress levels! Jodi, making connections like these, between behavior and actions, always feels like a light bulb switching on above my head! It’s a great feeling when your sense of self-awareness opens up a bit more, isn’t it! I hope it’s helpful in the future. Spot on! I take stress out on my hair. But I need to. I can’t control how often my husband is gone for work and school. I can’t control the amount of medical drama in my life right now. But I can control my hair. And chopping it off makes me feel alive and real and better about life, like I’m ready to take it all on again. I have noticed that my hair appointments are much less frequent now than they were when I was working on my master’s degree! Amazing timing of the article. I had just been obsessing about my hear and scheduled an appointment. When I set out to grow my hair I wanted it 3 more inches than where it is today, yet all of a sudden I am ready to cut it all off. What a great and fantastically written article, and what a great ‘put the breaks on’ for me! You’d think I’d know better! In my first marriage I thought it was WHERE we lived that was the problem, so we moved from one place to another, one nicer after another, until my house was facing a golf course and I had 28 windows to dress. That’s when it dawned on me that perhaps it wasn’t the house that was the problem all along. Perhaps it’s not my hair this time either 🙂 Just overwhelmed with life. Thanks, Ashley, for putting my breakes on. I honestly never got the connection between worsening depression and cutting my hair. Oh my gosh, perfect timing!!! I had a horrible day and work and on my way home I was thinking I need to chop and color my hair. I was about to pick up the phone to get my appointment set! This makes total sense. I could not control the patients that called, my co-workers lack of help or my sense of being overwhelmed. What could I control… my hair. PS. I also happened to buy a purse (for my birthday, and from a consignment store) and some ice cream. Did they make me feel better and more in control, a bit. Having just cut my hair all off (first haircut in a year), I can say this is definitely true. I needed to embrace some change and it has been interesting to see how many people cheered me on–almost like they were silently waiting for me to cut it–to shed some skin. But I have other obsessions. And those are how I know what you’re writing about is exactly true. My need to “shake things up a bit,” mostly due to boredom in my tired routine. But I have little kids. Who need that boring (ahem, structured) routine. And it’s not about me anymore, right?! It’s all so confusing. I feel like a bad parent when I put my needs ahead of anything else. But a boring parent when I come home, make dinner (same thing each night for kids), and slump in front of the TV. Will I ever be gentler on myself?! And why do I have to please anyone, anyhow?! This is important for me. And soo needed. I get an itch, a need for a change of scenery, a need to get in the car and go. Anywhere. A need to paint entire rooms in the house disturbing, neon colors. (My ex’s house sports a salmon orange room, and half of the baby’s room is a bright yellow.) 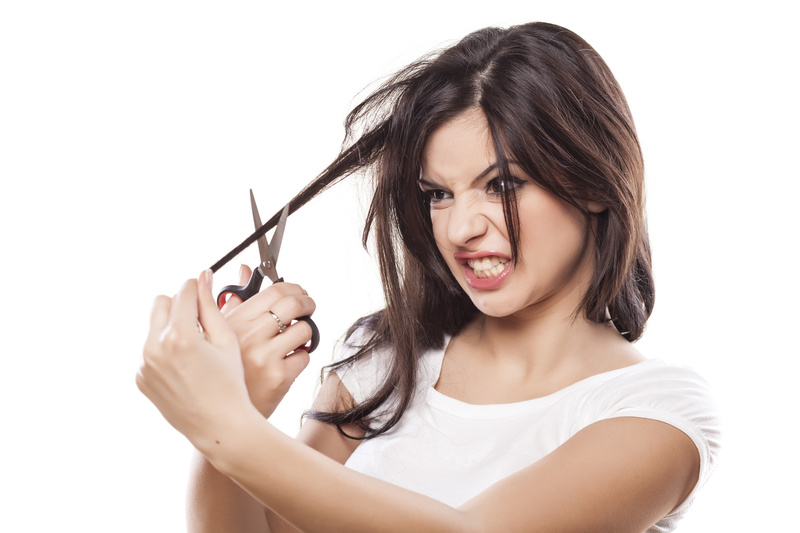 The desire to cut my hair has also attacked me, and is usually dealt with by dying it. I do lead a busy, hurried, hectic life, and perhaps I should start looking at it closer, especially when the need for drastic change hits. “As stress levels rise, our need to control something (anything!) increases, too.” Wow, that this describes me lately. I sometimes find myself ‘spinning’ before I find myself completely focused on something (want to change my hair, clean some area of the house, etc). I needed this article and need to learn to slow down before doing something drastic. Wow, Ashley! I’ve been thinking about a fresh ‘chop’ for a few weeks now and maybe introducing some highlights – since I unexpectedly found a strand of the lighter variety! Your post makes me think now – do I really ‘need’ a brand new style, or just tidy up what I have? It is so important to examine our motives for doing things. I frequently find myself experiencing the desire to rearrange things in our house. When I think about it, I realize it stems from a feeling of boredom, but why am I feeling bored when there is plenty to keep me busy here every day? The solution is usually to change my attitude and be more diligent in my work. Diligence and a servant’s heart help me develop fulfillment and contentment. Is there a time when it is appropriate to cut all of your hair off? Is it okay to have a bad intention for cutting off hair and doing it anyway? I was curious if you were more dis-appointed with yourself after you cut your hair, or felt a relief, albeit temporary? I often struggle with my own hair choice and its relationship to my identity. I wonder how people perceive me when I have a beard and/or mustache. I just recently cut off all my hair before the new year. I felt fear as the barber sheared a line down the middle of my head, but ultimately I’ve felt a relief from carrying all that extra weight of hair. Many people hardly recognized me when they saw me again, and it was nice to ‘meet’ people again. I feel more me right now. However, other than my being a cis-male, my experience is a bit different. I had grown out my hair to cover up my face, to hide from people. I liked to say that my mustache smiled so that I did not have to. Maybe the most important thing is for me to be gentle with myself whatever I do, cut or not cut my hair. And being hair, it will grow back! Thank you for your honest and thoughtful piece! Thanks for your insightful comments. It’s always interesting to hear things from a different perspective. I know at least one other reader commented that she used her hair as a shield against the world. I’m sure there are many, many more who would agree with you, and I can completely relate. It is definitely worth clarifying that not every haircut is a bad idea! It’s just crucial to define the “why” behind the big decisions we make. Helps you not regret your decision, to be sure. It’s sad, but true, that how we look plays a large part in how we are treated. It sounds as though you noticed a difference in the attitudes toward you, after the big chop. As a male, the stereotypical ideal is clean-shaven, don’t you think? I’m willing to bet people were friendlier on the street, more willing to look you in the eye, etc. Sad, but usually true, in my experience anyway. And please understand I’m not saying everyone is like that, by any means. Just more than we would hope for. Females have the opposite stereotype to fight against. With short hair, especially on tall women life myself, I find people were dismissive, intimidated, or hyper-critical of my short locks. That said, screw them! I’ll definitely be chopping my hair in the future…I love trying new looks. The caveat being I’ll make sure I’m cutting it for the right reason. I think there’s a time and place for big changes that stem from negative reasons. If you’re getting out of a relationship where a certain “style” was encouraged – by all means, do the opposite! If you’re hiding behind your hair, as you describe…what a feat of strength to cut it all off!!! Kudos. Finally, your words or wisdom about being “gentle on yourself” is so important. Because, yes, it will grow back if you don’t like it. And it’s not the end of the world…but it sometimes feels that way if you’re chopping for the wrong reasons. Catching up on my MSM reading and OMG this came at the right time. Just told hubby at lunch that I want to chop my hair off (it’s mid back) and he’s like WHAT??? I am super stressed out, so that makes sense. 🙂 I think I will thank you for this later Ashley! So glad we were in the right place, at the right time, Nicki! Thanks, now I know why I have been obsessing over a vacation. I think I have been trying to escape my stress!